Update: Added cutting notes and diagram at bottom of post. This was a special request of a friend at work for her daughter who loves Minecraft. Definitely not a quilt I was looking forward to, all solids is not really my thing, and these colors are not girly. Plus I had to design the pattern, being somewhat difficult since I have never played minecraft. It ended up being a couple long weekends, and ended up being more fun than I expected. This was the sort of quilt that you just start and try to move through as quickly as possible because you want to make it for the person who will get it. A labor of love for the recipient, rather than the quilt. Each pixel is a 3×3 square. But I made some strips to reduce the number of squares. So there are some 3×6 and 3×9 rectangles in there. I became acquainted with my hera marker and did a 3×3 quilted grid. I am happy with this quilt, and also happy that I don’t have to make another. 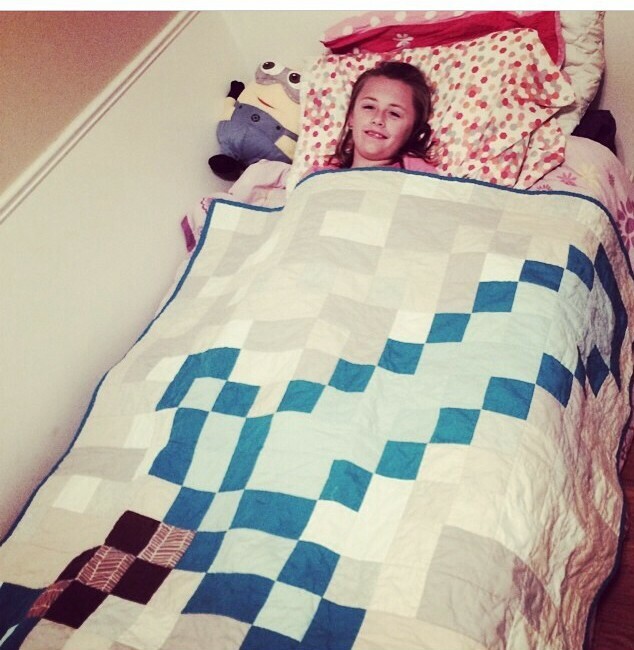 But the proof is in the pudding of this adorable picture of my friend’s daughter loving her quilt. So worth it. I still have my notes for this quilt, so if anybody wants a rough pattern, let me know and I can write it up pretty quickly. This is the cutting list and layout diagram. 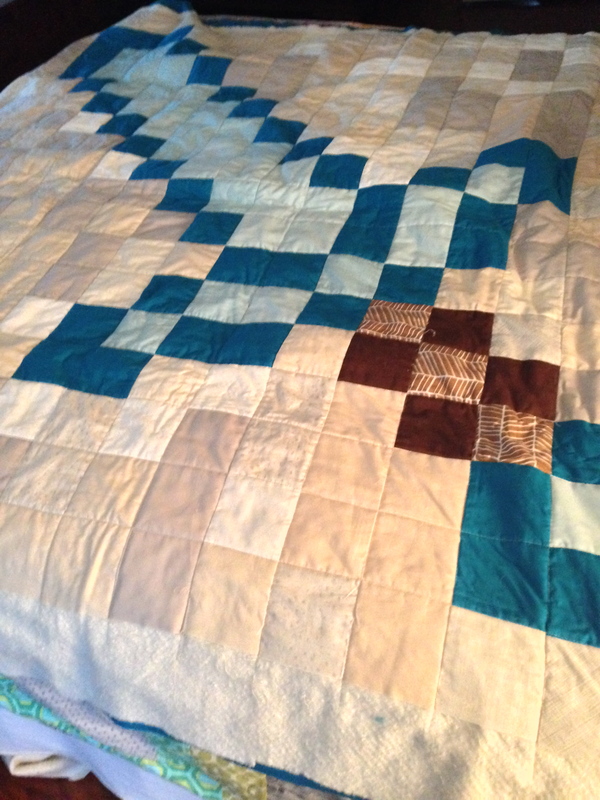 The quilt finishes at 54″ square. The cutting dimensions are unfinished, assuming a 1/4″ seam throughout. For the past 4 weeks, I have been chugging along at finishing about 2 quilts a week. They were small quilts, mostly done, and I have gotten good enough at machine binding that it doesn’t embarrass me to finish quilts this way. This weekend my pace got a lot slower. On Saturday we went and lived a bit of life with a trip to Weston, MO. So I really had only one full day of sewing (cue tiny violin). 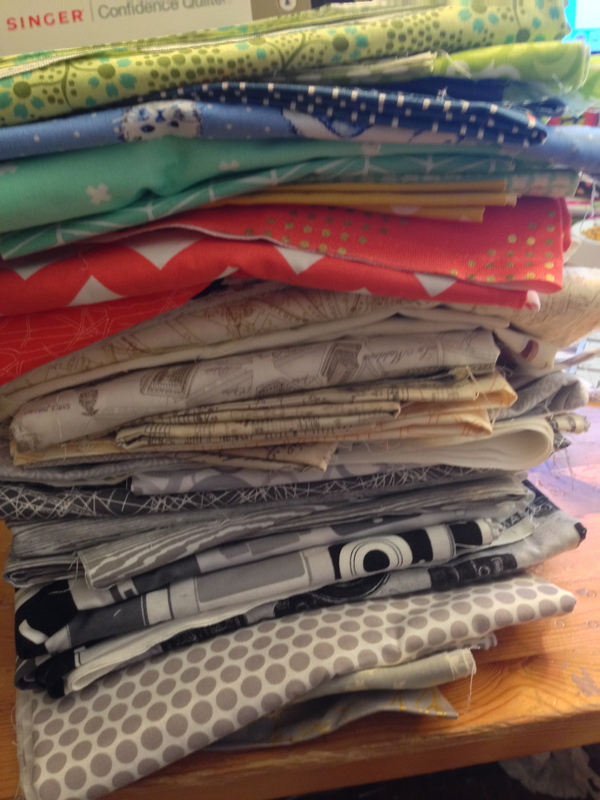 Plus I hit the part of my to-do list that required making quilt tops, not just quilting and binding. I have a friend who has daughters for whom I have wanted to make quilts. 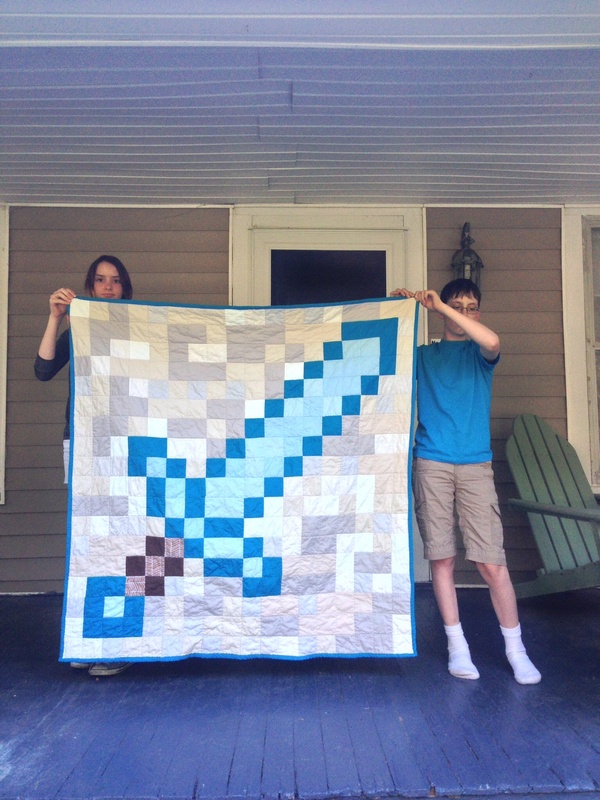 One of them really would love a minecraft quilt. Which I wasn’t too excited about – because it would need to be a biggish quilt (well, bigger than a baby quilt – she is 9 years old) and it would be with just solids. But over the last week I have buckled down and am almost done. I ended up having a lot of fun with this quilt. 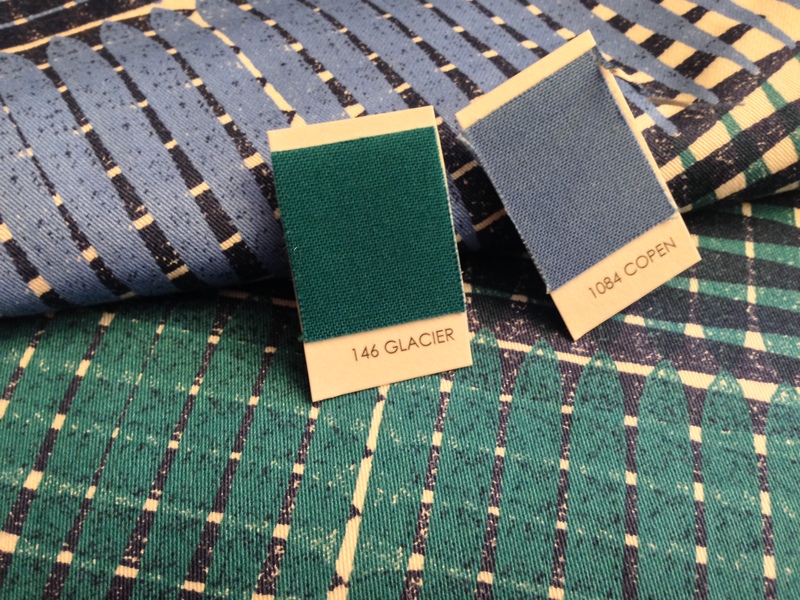 I LOVE the color combination of the blues and pale greys and beiges. And I used up some white on white fabric, which I can’t imagine I would use otherwise. The quilt for her second daughter is going to be “pixelated” also – using the Scraps, Anyone pattern from KC Project Linus. I only allow myself to use one of the awesome KC Project Linus patterns “for personal use” if I also make a quilt FOR Project Linus using the pattern. So add that to my list. With not even getting one whole quilt done last weekend, I think I have to adjust my to-do list expectations for August. I had wanted to get done with everything except for just-for-me fun sewing, but there is no way I can get done with 8 Project Linus quilts by the end of the month. That was crazy. So my goal is to get through 4 so I am caught up for the year, and make the rest once-a-month as planned. 1. Irish Chain Interrupted – still need to be liquid enough to send this off for quilting. WAY too big for me to do at home. 7. 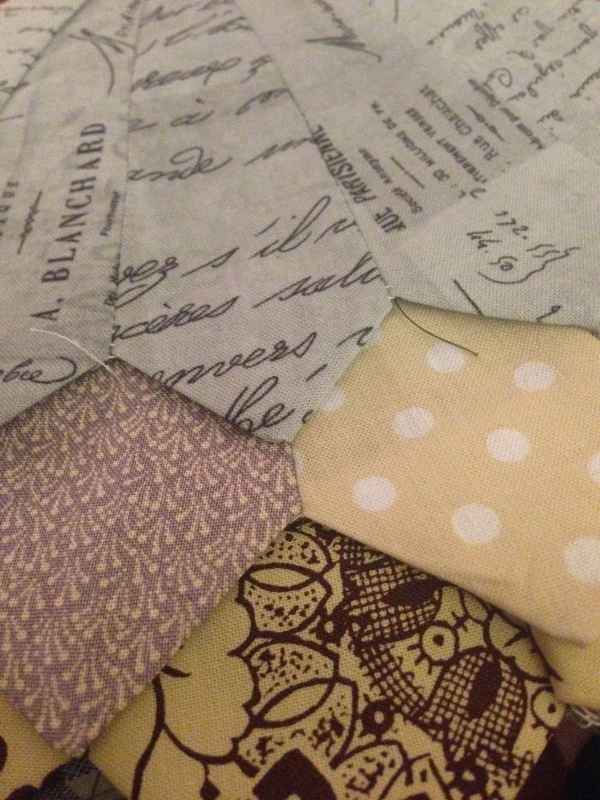 Shades of Yellow Pixelated Project Linus Quilt – Just in my head – to pay for the karma of using pattern for #5. 8. SD’s Brick Quilt – I really do need to make quilts for my own kids. I don’t think it bugs them as much as it bugs me, but I want to get a quilt for at least one of them done this month. Or at least pieced. This one will need to be sent off for quilting. Once I get through this list, I can focus on some selfisher quilting projects. Which is good, because the list is GROWING!! Windmill quilt, gypsy wife, new living room wall hanging, single feather wall hanging, hexagon placemats – oy, so much to do! 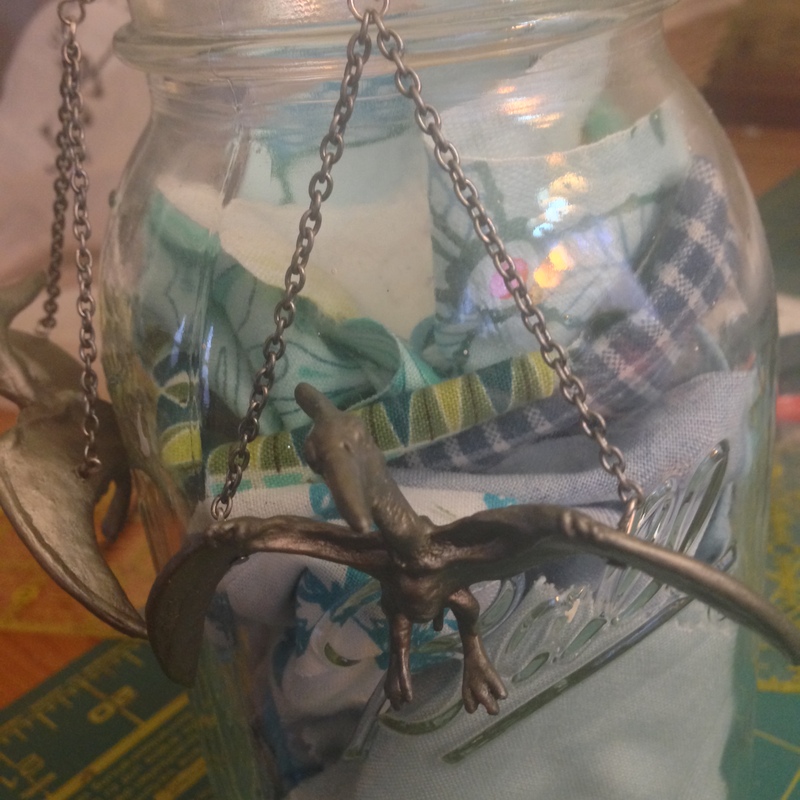 One of the things that makes me happiest is when a friend asks for a piece of custom work. It does wonders for my ego, as well as give me a chance to design something with someone else’s style vantage. First up – some dinosaur earrings. They are made using plastic dinosaurs and an outdoor paint that works on all surfaces. A few years back I found a paint that works for painting dinosaurs – a unique and frustrating problem. It was fun to use this technique again – and the results are lovely and menacing. Next up – a dresden pillow that I LOVE. A friend said that she would love to have the extra dresden I have, but I knew the colors didn’t match her home, so I created a new one that matched her gorgeously decorated bedroom. Did I mention I LOVE this? A great example how changing my viewpoint can create something lovely. This was done all from stash fabric except for the gorgeous linen-looking charcoal. 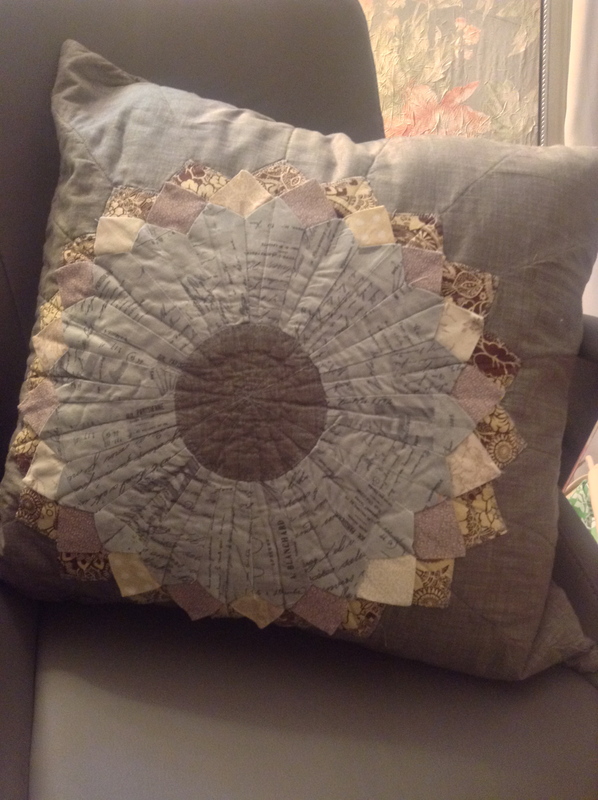 I tried three different circle fabrics before deciding on using the dark gray in the middle. Much more modern and gorgeous.